A retail organization's first store location is often labeled as its "flagship" location. The word flagship, is borrowed from nautical terminology, where it most often refers to the lead vessel in a fleet. A broader definition allows the "flagship" designation to also be given to a ship that is the largest, fastest, newest, or most famous. That broader definition seems to appeal to the retail industry, where the "flagship" designation is liberally applied to stores in prestigious locations, stores with unique features, and stores that are larger than the average outlet in the chain. Taken to the extreme, retail stores are now being designed and strategically placed in worldwide locations specifically so that they can be labeled as flagship properties. These stores are being positioned as the highest and best that the brand has to offer, and are being used as testing grounds for innovation and experimentation. With the prestige that the term now garners, flagship stores grab headlines, draw crowds, and provide retail organizations with an opportunity to turn an ordinary expansion into a notable global event. Nothing creates an instantly powerful brand presence in a city, state, or country like the flashy unveiling of a retail outlet that is designated as "flagship." If only the most basic definition of "first" is considered, then every retail organization has a "flagship" store. But when taking the broader meaning of the term into consideration, the number of retail chains with more than one deliberately created flagship location is small. There is an even smaller number of elite organizations that are employing a flagship strategy as a proactive vehicle for high-profile expansion. Some of these organizations are highlighted below, along with some of the more prominent stores that have earned the right to lead their retail fleet as flagships. Because of the prestige associated with Manhattan retail real estate, New York store locations are designated as flagships almost by default. Many global retail organizations have chosen New York addresses because of the credibility and visibility they provide. Many U.S. retail organizations established their legacy there. Here are some of the most famous stores with New York addresses and the superlative features that have helped them gain their flagship designation. A newborn doll nursery, a 6,000 square foot candy store, an in-store cupcake baker and the famous BIG piano are just a few of the features of this iconic New York flagship toy store. A complete line of Cacique lingerie and flagship-only merchandise make this Lane Bryant Manhattan flagship store different from the rest of the Lane Bryant Chain. Video walls, Swarovski crystal chandeliers, and a special NYC collection are a few of the things that make this upscale flagship store a must-see for Victoria’s Secret fans. Eyebrow Bar, Yogurt Bar, take-out food, locally crafted NY beers make this Walgreens flagship store much more than a pharmacy. Fifth Avenue & 39th St.
Made famous in the film, "Breakfast at Tiffany's"
What follows is a list of flagship stores that are located in London, England, UK, along with the unique features that qualify the store for "flagship" designation. A chandelier fashioned from 4,000 pairs of Oakley sunglasses is just one of the features of this luxury Oakley UK flagship destination store. Apple's largest store with an estimated rent of £1.5 million a year. Events and workshops are held daily in the two-story shop. It features a two-story wall of trunks – to showcase the Louis Vuitton tradition of working in leather – and a glass and LED staircase. The 15,000 square-foot store is designed to reflect the 21st century mood of London and bring together innovation, heritage and fashion. Features a library which showcases the best of British contemporary Art Books and commissions. The store’s second floor is a luxurious private client suite, which can only be accessed by invitation. The store has the largest collection of women sports clothing and footwear in Europe. The store took two years to build and cost between $46.7 and $62.3 million USD. The flagship Oxford Street store is the second largest shop in the UK. Known for its outstanding architectural features and masterful decorations. Selfridges is known for its food hall, which includes a section with popular American food products that are rarely found in London. The most fantastic feature of the new store is the carpet. It stands out in Azagury-Partridge’s signature style. The first floor of the two-story boutique is an impressive meeting of theatrical and whimsical. Everything has been choreographed and specially made for the space. Downstairs is a private-member area featuring hidden doors, alcoves and padded walls. The ceiling is decorated with 600,000 Swarovski crystals. The 1,906sq ft Oxford Street flagship features a 975 square foot sales floor, along with a Social Sun station for an interactive experience. There is a VIP lounge for private fittings and press appointments. The flagship locations feature over 30 designer brands in an expanded brand assortment, plus newly launched brands. The new flagship store concept aims to provide an innovative, interactive experience that celebrates fashion and shopping. The London flagship is UNIQLO’s largest store. Authentically recreates the unique experience of modern Japanese retail culture. It was designed by the renowned interior designer Masamichi Katayam. The 80,000-square-foot store is the first Whole Foods Market in Europe. It is spread across three floors in the historic Barkers building on High Street Kensington. The ground floor includes an in-house bakery in the Provision Hall, which features a wine and cheese bar. A team of 55 in-store chefs will prepare a range of fresh foods. Downstairs is Market Hall, which features more than 10,000 grocery items. Shoppers can select from nearly 100 options including nuts, oats, and grains. At the London store, Whole Foods is launching a new Five-Step Animal Welfare Rating Program, which allows shoppers to understand how the meats they are buying were raised and treated. Chinese shoppers seem to judge international retail stores based on the size, location, and curb appeal of their physical buildings. Most of the biggest and best flagship stores in China are filled with luxury brands that cater to upper-income shopping. This is a list of the flagship stores that major global retailers have opened in China, along with the features of those stores that have earned them the elite designation of "flagship." The exterior of the building is completely Coach branded with logos and signature Coach patterns on the walls and windows. When it opened, the Beijing flagship was Sephora’s biggest store in the world. 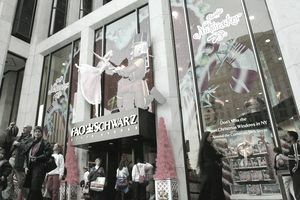 Store features a 9-meter-high shoebox tower which also serves as the staircase.